If you’re ever in New Orleans, I highly recommend going to Preservation Hall on Saint Peter Street between Bourbon and Royal in the French Quarter. Brave the line that frequently wraps around the block, because in this unassuming, dilapidated building you will hear some of the best jazz New Orleans has to offer, and all in a wonderfully intimate setting. If you’re lucky, you’ll catch the Preservation Hall Jazz Band, the house band that plays there the half of the year they’re not on tour. When I went last year, I got to sit on the floor at the feet of the trumpet player. Everyone near me was friendly and chatty, and the band took requests for tips. It was one of the best live performances I’ve ever experienced. 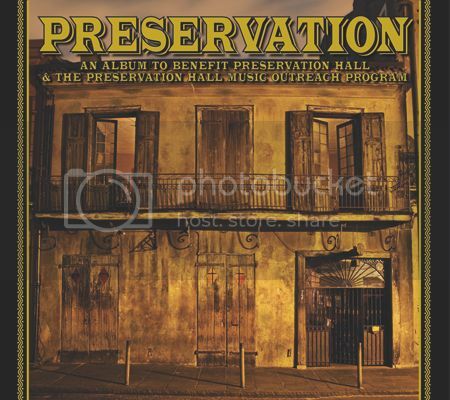 Last month, The Preservation Hall Band released a new album, Preservation. Every song on the album is the result of a collaborative effort with a different, respected artist, such as Pete Seeger, Merle Haggard, and Jim James. Besides being a great collection of music with talent packed into every note, sales of the album benefit the Preservation Hall and The Preservation Hall Music Outreach Program. The band, hall, and outreach program all work to educated, preserve, and continue the music and culture of New Orleans style jazz. As one of the first forms of truly American music, jazz is an important part of American history and culture, and well worth our appreciation and support. The opening track, Shake It And Break It, features Andrew Bird letting loose with some refreshing swing, and also gives the band room to flash their impressive instrumental chops on the break. If this song entices you at all, then get ready. You’re thoroughly going to enjoy this album. Tom Waits hits hard in track three, Tootie Ma Was A Big Fine Thing. He gives his signature vocal stylings a Fats Domino style flair to hot (I mean smoking like good barbeque) ends. I can barely understand a word he’s saying, but when the trumpets come in I can’t help but stick a leg out and shake what my momma gave me. Freight Train, track eight, has Ani DiFranco sounding more like Patsy Cline than anything like the angst she was branded with in the 90s. Upbeat, sweet, and sincere, I can picture her standing on a street corner singing for change in a floral print dress. And…I kind of want to be her. It’s a sing-along of the highest caliber. The pure talent of all the musicians takes this simple song, and executes it with a flawless skill, transforming it into something irreplaceable. Opening with some freaking fantastic organ, track twelve, There Is A Light, builds with the renowned harmonies of the Blind Boys of Alabama to culminate in a soulful jam out. It’s a slight break in genre for the album, but serves as an awesome reminder of the rich influences religious music has had over jazz. T’ain’t Nobody’s Business, track sixteen, with Steve Earle is a song I almost always listen to twice. Between the mention of Memphis, the blues tinge on the vocals at the end of the chorus, and the lovely hints of oboe, it’s hard to say what I like best about this song. Finally, the album ends with track 19, La Vie En Rose. Sung by Angelique Kidjo, who charmingly reminds me a little of Nina Simone, the lyrics are in French and their delivery is reminiscent of Parisian salons. Yet, the instrumentals are undeniably American jazz. It’s perfectly suiting, and embodies vibrant fusion of cultures that comprises the true spirit of New Orleans. If you’re a real music nerd, an avid fan of any of the musicians featured on this album, looking to get an introductory jazz education, or simply enjoy supporting the arts, you need to pick up a copy of Preservation. Join the ranks of the countless people who have been entertained and inspired by the many incarnations of the Preservation Hall Jazz Band for almost half a century now. Visit the album's official website for more information and a full track listing. You can also listen to songs from the album, and see photos from the recording sessions.